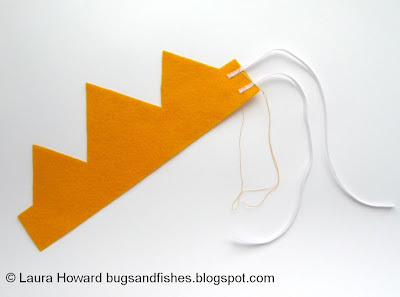 Fancy making some felt crowns? These are great for fancy dress parties and Halloween, birthday parties, dressing up sessions and for any other occasion when you fancy wearing a crown and pretending to be a king or queen, a princess or a prince. 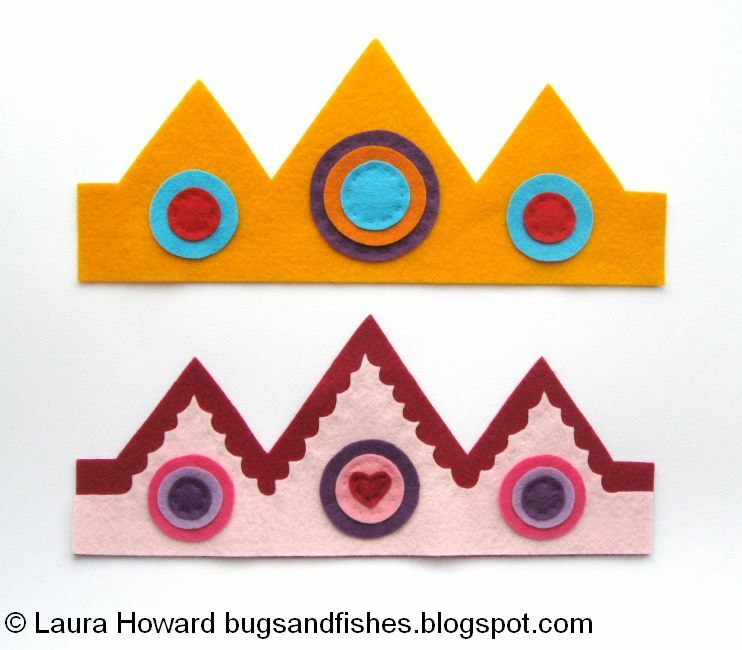 There are two designs - a basic crown and a slightly more detailed "princess" crown. You can follow the colour schemes shown, or choose any colours you want when making your crown. You could also personalise the crown, for example by adding an embroidered initial in the central circle, or adding extra detail to it with decorative embroidery, sequins or pretty buttons. The instructions in this tutorial are for making a crown that will fit an adult or older teen. If you're making a crown for a younger child, use shorter lengths of elastic (and print the template sheet at a slightly smaller size if needed). 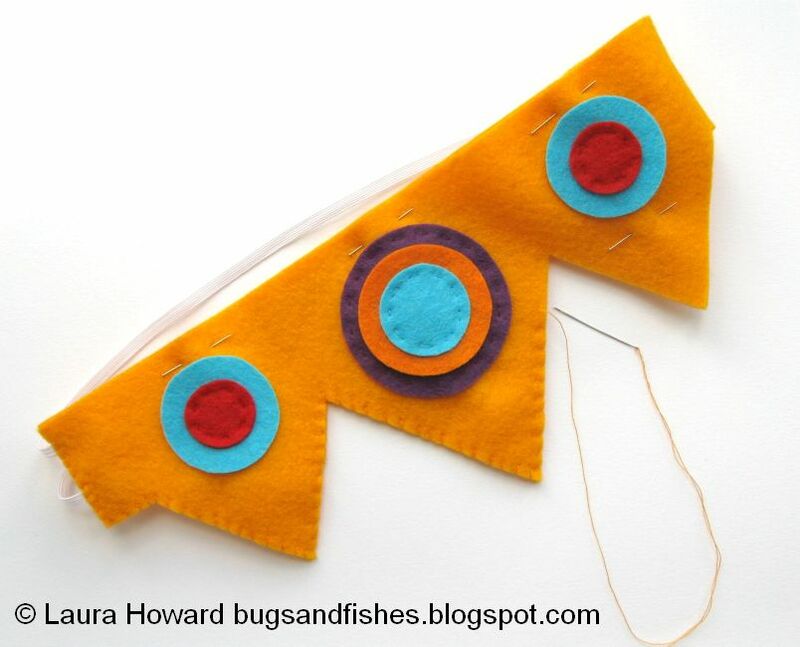 If you're making it for a young child, make sure to sew all the pieces on very securely, avoid using choking hazards like buttons, and always supervise them when they wear the crown. You can use any type of felt you like for the decorative details, but for the main body of the crown make sure you choose felt that isn't too thin or floppy. 1. 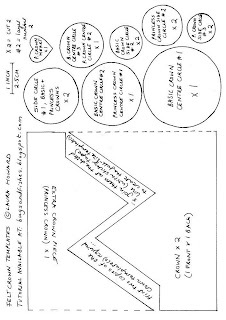 First, use the templates provided to cut out all the pieces needed (as marked on the sheet). 2. 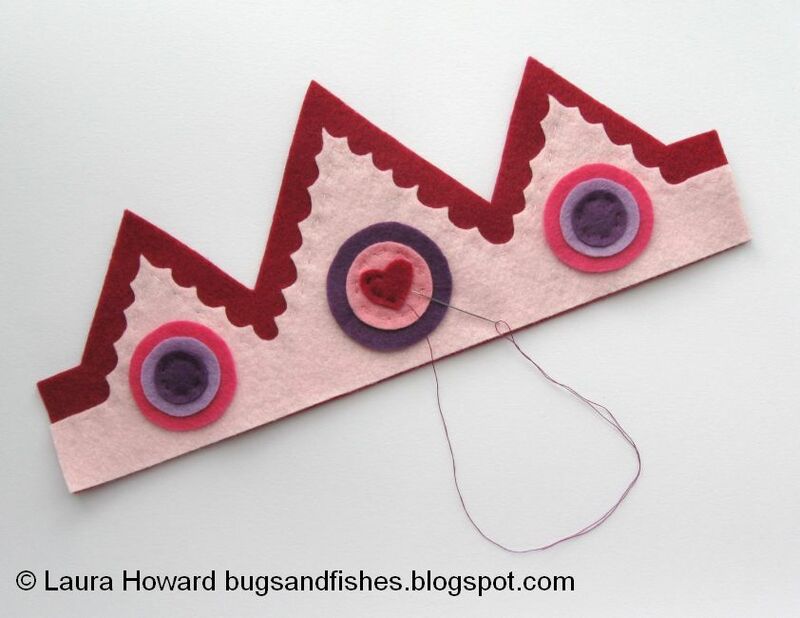 If you're making a princess crown, create a decorative edging along the three points of the extra crown piece. 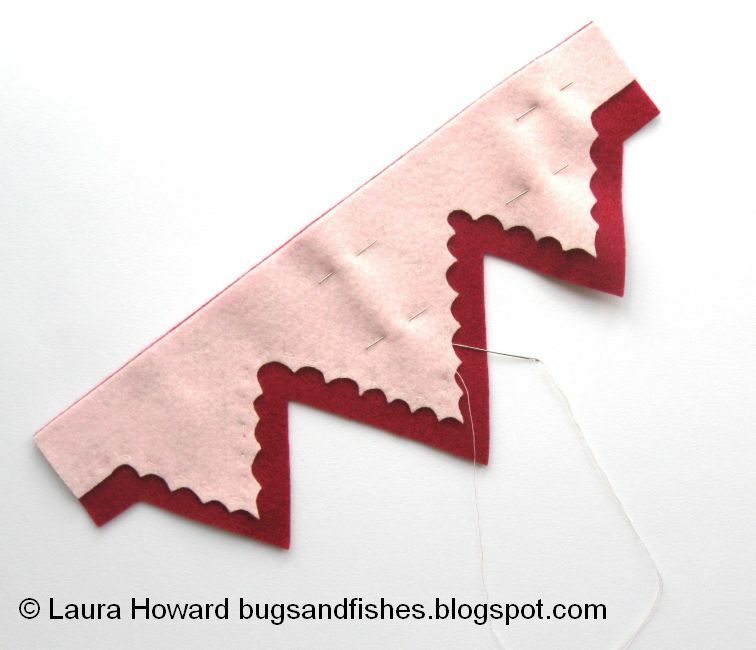 I used embroidery scissors to cut a series of small semi-circular shapes along the edges of the three points, creating rows of curved spikes. 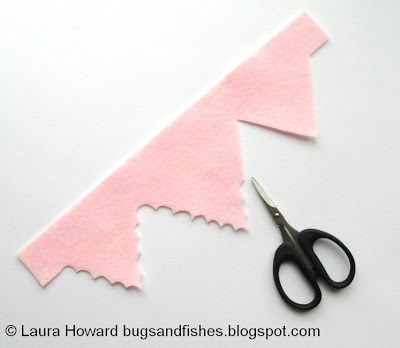 You could also use pinking shears to create a zig-zagged edge. 3. (If making the princess crown) Pin the extra crown piece onto the front crown piece, as pictured, then sew the layers together. Sew along the top (pointed) edge with running stitch and matching sewing thread. 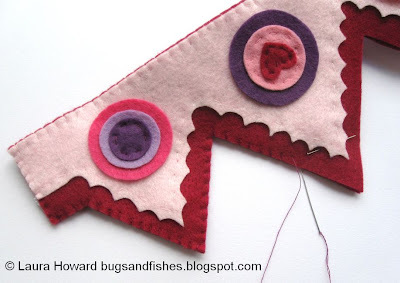 There's no need to sew along the sides or the bottom edge as these will be sewn together later. Then remove the pins. 4. 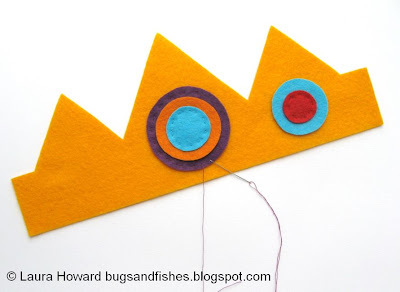 Add the decorative felt shapes to the front of your crown, using running stitch and matching sewing threads. You can sew each shape on one by one, or save time by adding several layers at once. Now's the time to add any extra decorative details you fancy (sequins, etc). 5. Then cut two lengths of elastic, each approx. 32.5 cm (13 inches) long. Using sewing thread to match the felt, sew the elastic onto one side of the back crown piece so they overlap the felt slightly as pictured. Use whip stitch and try to sew into the felt not through it. Now is a good time to check that your crown fits! Try the crown on and (if necessary) unpick, reposition and resew the elastic. 7. Pin the front and back of the crown together, right sides facing outwards. 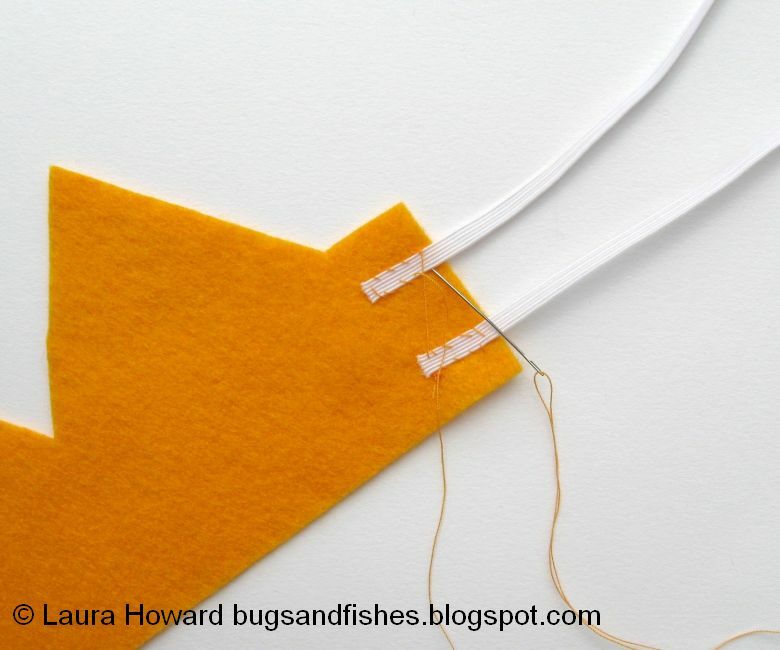 Use matching sewing thread and whip stitch to sew the front and back edges together, removing the pins as you sew. ... but when making the princess crown two shades are needed. Start with thread matching the extra crown piece, sewing down the side, across the bottom and then back up the other side. 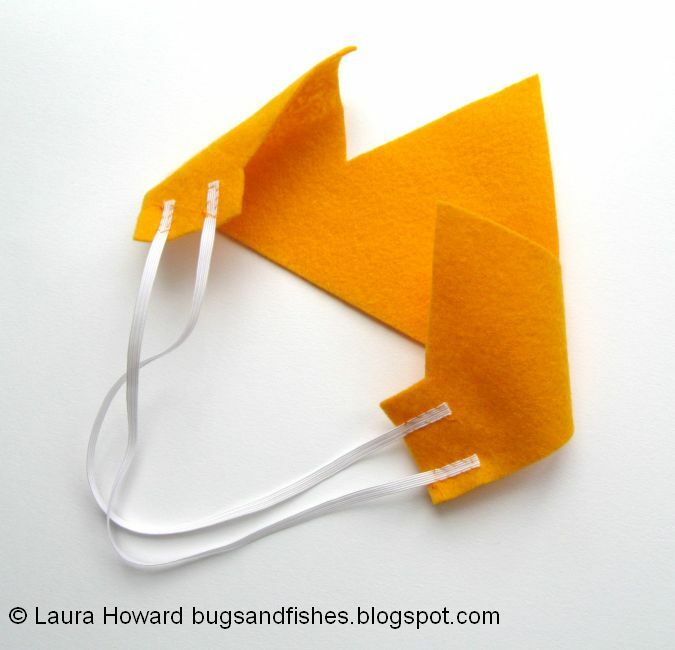 Then switch to a shade matching the main crown colour and sew the remaining edges. 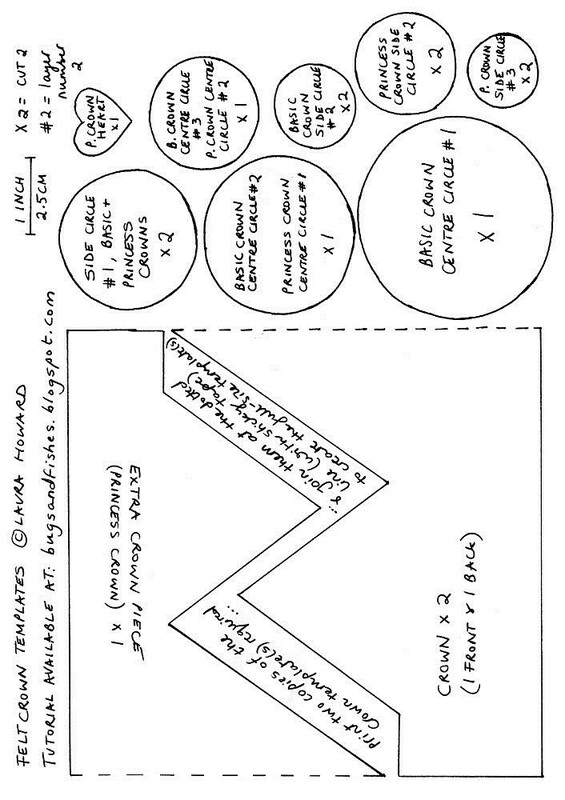 Click here to view the template sheet in another tab or window. Make sure you're viewing the image at full size, then print it at 100%. This tutorial is for non commercial use only: you can use it to make as many crowns as you want for yourself or as gifts, but please don't make any for sale. You may borrow a few photos if you want to blog about this project, but remember to credit me and link back to the original source, and do not reproduce my entire tutorial on your site. Thanks!